its the Hollywood Walk of Fame, not the Hollywood Walk of Talent, right? Renee du Jour and Miss La Diva. Puppet show by Baboon Torture Division. 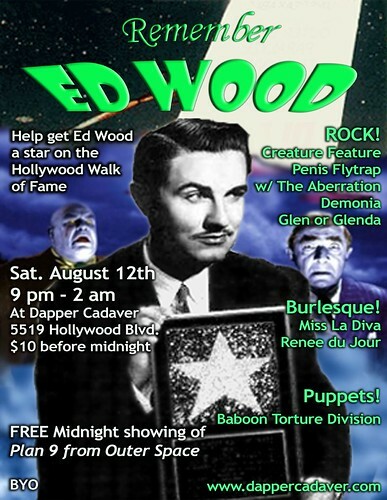 Proceeds will go towards the Ed Wood Star Fund. black_godzilla I'm a gay 22 year old horror movie man and I'm looking for a few new corpes to add to my grave yard. I'm a friendly creature of the night so if you add me I'll add you back. 11:35 am - Like Rob Zombie? canterburyburns Here's an exclusive trailer for his sequel to House of 1000 Corpses, The Dev!ls Rejects. Just thought I would let everyone know that such a kick asss film is about to come out. I love Rob Zombie. 11:13 pm - New Freddy community! Are you a Freddy Krueger fan? Do you happen to lovbe Robert Englund and his great work as an actor? Do you love talking about both of them as the most awesome person/Springwood Slasher's they are? If you answered yes to all of these questions, then you have to join my new Freddy Krueger/Robert Englund community! Go join now and have fun all you precious childeren...buwaha! clickie clickie! you know you wanna!